By now most of us are familiar with the Fallout 4 console commands and can create our own little fantasy skirmishes between the wasteland's many and varied foes. Still, there are certain confrontations that don't seem wise if you care about frame rate. 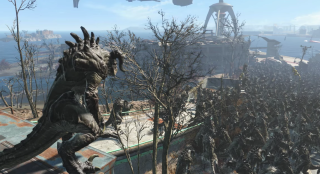 Take for example this battle between 300,000 deathclaws and 300 Brotherhood of Steel soldiers. Doesn't sound like a good idea, does it? Well it is. It's a very good idea and you can see it play out above, courtesy of Cosmic Contrarian. I won't spoil the outcome for you but, as you can probably imagine, lots of things die – chief among them the frame rate. If you want to see more stupid battles, check out our collection of the weirdest, funniest stuff encountered (or arranged via console commands) in Fallout 4 so far. Or else, create some mischief yourself.